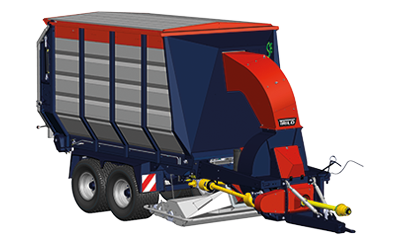 Extra large TRILO vacuum sweepers with a bin capacity of 14 – 20 m3 for collecting litter from wide areas. For the collection of large quantities of litter extra loading capacity is desirable since that saves a lot of driving back and forth from and to an unloading point. A powerful fan provides an enormous suction power and is mounted in a housing fitted with a replaceable lining. A rotating brush shaft mounted in a suction hood sweeps the litter up into the airflow and the litter is vacuumed up and collected. The fan is driven by a PTO drive shaft attached to the tractor and requires an output power of The required hp PTO can vary depending on the working conditions.75 – 110 HP (55 – 81 KW). • Sweeping and collecting litter in one pass. • Large radial tyres – Low ground pressure. • Ability to continue working longer because of a larger loading capacity. • Easy loading/unloading with a chain floor. • Can be operated by a single person.